of various sizes - 12mm, 16mm, 19mm and up to 32mm. 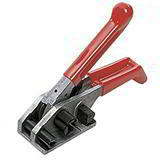 Simply feed through the polyester strapping and use the handle to draw the strapping through and tighten it. This extra heavy duty polyester PET strapping tensioner is an advanced hand strapping tool for the heaviest PET applications. It is made from high quality cast steel and has a patented vertical gripper motion that allows for greater holding power and easy strap release. 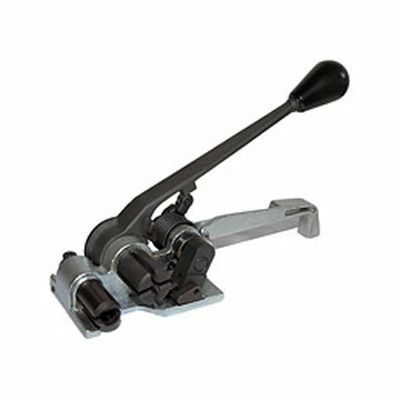 It is the ideal tensioner tool to apply high tension polyester strapping around pallets and export cases. 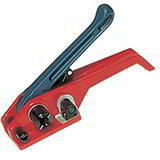 As well as this heavy duty polyester strapping tensioner tool, you will need a PET strapping sealer tool and seals, or strapping buckles to retain the tension and secure the load. Simply ring for advice about extruded PET and cord polyester strapping tensioners. Some people ask us for advice on tools for thick plastic banding, and with over 35 years packaging experience, we'll help you make the ideal choice. 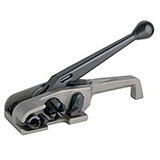 We have a comprehensive range of heavy duty polyester strapping tensioners in stock for fast delivery, and we aim to offer the lowest UK prices on plastic PET & polyester strapping tensioner tools. Tool tensions heavy duty polyester strapping around pallets, crates etc.